N.B. Sorry for the delay in posting this recipe. I usually post on the first day of the month. Computer was down. But it's a very simple one so you won't need a lot of time studying it. Bon appétit! There are words that are confusing in any language. Take, for instance, the French word loup (pronounced “loo”). In class, I was told it meant wolf. There’s the grand méchant loup, the Big Bad Wolf that ate the grandmother of Petit Chaperon Rouge and hid in the bed to try to eat her, too. There’s the loup garou, the werewolf that seems to exist in all cultures down through the ages. In the French folklore of the mountainous central Lozère region, there’s also the still unexplained Bête du Gévaudan, a wolf (or large wolf-like dog) which attacked 124 people between 1764 and 1767... and then just disappeared. In modern times, the Gordon Geckos of the French variety are called jeunes loups aux dents longues - young wolves with long fangs. If you’re famous or infamous in France, you will be as instantly recognizable as a white wolf, connu comme le loup blanc. Polar cold is known as a froid de loup and if you’re ravenous you have a faim de loup. And dusk falls somewhere between the hour of the dog and that of the wolf - entre chien et loup. So you can imagine my confusion when I first saw loup au fenouil on a menu in Paris. The French eat a lot of strange things - frog’s legs, snails, Lord knows how many different types of offal... But wolf? And why accommodate it with fennel? Then I found out that there is a variety of fish called loup. At least it’s called loup in the Mediterranean; everywhere else it’s called bar, which means sea bass. The only sea connection that might tie these two together is the vieux loup de mer, the old sea captain. But I doubt that’s it. Sea bass is a delicately flavored fish so it should please even those who don’t like “fishy fish” such as sardines, herring, even tuna or salmon. That’s why the fennel is added: to zip its blandness up a bit. Famous French chef Raymond Oliver calls it insipid and says it doesn’t need to be scaled; just gutted. To each his own. The fishmonger will prepare it for you anyway, unless you fish it out of the Mediterranean all by yourself, in which case you’re on your own. Chef Oliver grills it over dry fennel sticks. Good luck finding any of those. Luckily, he also suggests stuffing the fish with fennel fronds before broiling it, which is how I’ve always found it served in French restaurants. Whichever way you do it - outside on the grill or inside under the broiler - a three-pound sea bass will take 20 minutes to grill, 10 minutes per side. Couldn’t be easier. Serve it up right away with simple melted butter over the top, or else flambé it with some cognac, or better yet anisette, if you have it. The licorice-y taste will accentuate the fennel. Accompany it with a green salad sprinkled with sliced black olives, some crusty French baguette and a crisp white wine and you’ll see what August on the Riviera is all about. "But I know nothing about French history," you might say. "Ah, but you do!" I would reply. Robin Hood? Richard the Lionhearted? Prince John? Sound familiar? Religious? How about Saint Patrick? Or a bit harder now: William the Conqueror? Eleanor of Aquitaine? 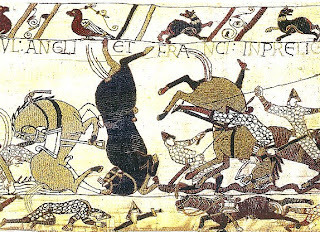 England was a "green and pleasant land", as the hymnal says, until 1066 when William the Conqueror, Duke of Normandy, sailed across the Channel from France and defeated England's King Harold in the famous Battle of Hastings. With that defeat, England's fate changed hands for two centuries. ﻿ Now for the easy part. Remember Richard the Lionhearted (think Robin Hood) and his evil brother Prince John? Well, they are two of the sons of Henry and Eleanor. And where did Richard die? No, not in Sherwood Forest or on one of the Crusades, but at Chinon in France’s Loire Valley, at the castle where Joan of Ark later offered her services to help "throw the English out of France", services for which said English burned her at the stake. And where are Henry, Eleanor and Richard buried? No, not in London's Westminster Abbey. 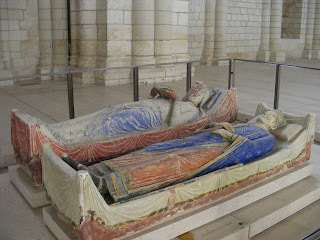 Their graves are in the Abbey of Fontevrault, again in France's Loire Valley. "But what’s this about St. Patrick," you ask? Well, he was born in England, carried off into slavery by Irish raiders, then later after being freed studied at the Abbey of Lérins, on a tiny Mediterranean island off of Cannes. Right next to the island of The Man in the Iron Mask (but that's another story). 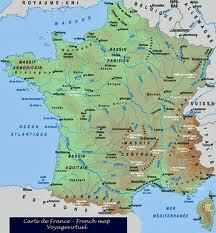 So you see, you may never have set foot in France, or read about its history, but you know a lot about it. You just didn't know you did. William the Conqueror? 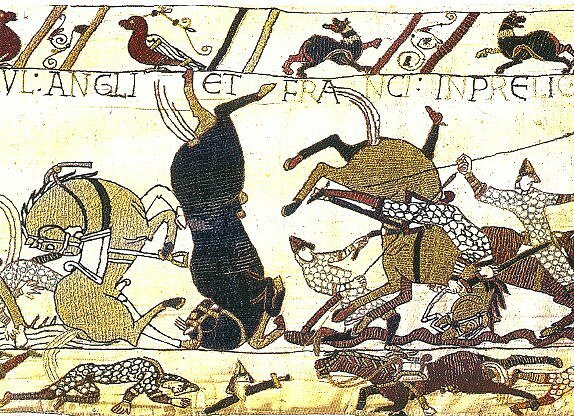 Go to Bayeux and see the famous tapestry woven by his wife Mathilda. For Richard Lionheart, tour Chinon and its castle. For Eleanor, Richard and son Henry, visit Fontevrault Abbey near Chinon. For a touch of Aquitaine, try any Bordeaux vineyard or truffle farm in Périgord. Joan of Ark? Choose Chinon, or Tours where she bought her armor, or Lorraine where she was born, or Rouen where she was burned. For St. Patrick, take sunscreen, travel south and hop a ferry from Cannes to St. Honorat Island. And for you film buffs, watch "The Lion in Winter" - the 1968 version with Peter O’Toole and Katharine Hepburn - for a fly-on-the-wall view of some momentous family feuds between King Henry and Queen Eleanor at Chinon Castle.